From 2019, India would start to receive the much-awaited Dassault Rafale combat aircrafts and the delivery and testing of the entire fleet of 36 fighter jets is expected to be completed by April 2022. 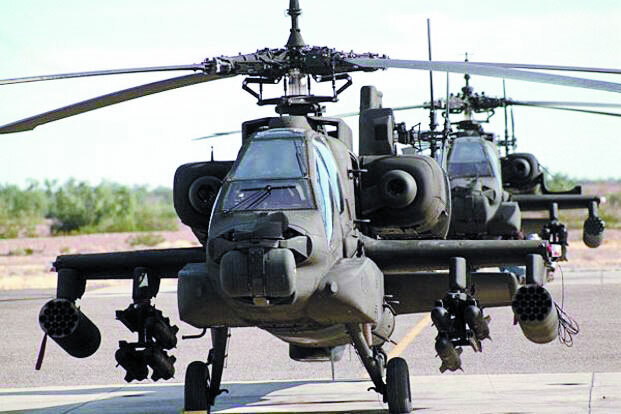 India would also start receiving Apache AH-64E multi-role combat helicopters and CH-47 tactical transport helicopters, contract for which was finalised in 2015, as well as M-777 howitzers, which was signed under a contract in 2016. The Indian Army will also receive most of the 1.86 lakh bulletproof jackets, which were contracted for in 2018. From 2020, India would start getting delivery of S-400 air defence systems whose deal was signed last October. It is also expected that by next year, India would have in place a clear roadmap and contract in place for arming the infantry soldiers of the Indian Army with a battle-proven assault rifle to replace the obsolete INSAS. What Modi inherited: Lack of modernisation of the armed forces for nearly a decade and challenges of grappling with obsolescence of existing equipment in the rapidly changing geopolitical landscape, were two major predicaments that the Narendra Modi Government had to confront in 2014. Rapid pace of military modernisation by both China and Pakistan exacerbated the situation further. There were only two choices in front of Prime Minister Narendra Modi — either continue to play politics of delay on big ticket defence acquisitions or take a decisive approach to modernise the forces while brushing aside all inhibitions and delaying tactics of the vested interests. The Prime Minister chose the latter. He preferred to go for fast-paced military modernisation. Big ticket acquisitions: In September 2015, the Narendra Modi Government signed deals with Boeing for acquisition of 22 Apache AH-64 attack helicopters and 15 Chinook CH-47 tactical transport helicopters under a three billion dollar deal. Order for six more Apache AH-64 helicopters were given in 2018. The year 2015 also saw the Government giving nod to acquisition of 10 Heron TP armed drones from Israel for $400 million. The Rafale deal was followed by Defence Acquisition Council (DAC) clearing the Acceptance of Necessity (AON) in November 2016 for acquisition of 83 Light Combat Aircraft or Tejas in the MK1A configuration, which would be equipped with AESA radars, self-protection jammers and air-to-air refuelling capabilities. A year later, IAF issued the Request for Proposal to HAL and reports indicate that Hindustan Aeronautics Limited (HAL) has submitted quotation for the same, which is under review by the Ministry of Defence. Incidentally, HAL is yet to get the final operational clearance (FOC) for LCA and conclude the delivery of the first 40 Light Combat Aircrafts (LCA), whose orders were placed in 2006 and 2010 respectively. Modernising artillery: In the realm of artillery acquisition, the first major step by the Modi Government in restarting the modernisation of artillery regiments of the Indian Army was through selection of L&T-Hanwha Techwin combine in 2015 for making 100 self propelled K9 Vajra howitzers. The contract worth around Rs 5,000 crore was signed in 2017. Further, a critical deal with the US was signed in 2016 for acquisition of 145 M777 ultra lightweight howitzers for Rs 5,000 crore, a deal which was pending for years during the United Progressive Alliance (UPA) era. In 2016, approval was also given for raising two more regiments of Pinaka rockets for Rs 3,300 crore and the fourth regiment of BrahMos for Rs 4,300 crore with more advanced versions of the cruise missile, proficient in trajectory manoeuvrability and with deep diving capabilities, to be deployed in northeast. Bulletproof jackets for infantry: If there was one product whose deficiency tormented the infantry soldier of the Indian Army for decades now, it has to be the availability of new generation bulletproof jackets. Like many other defence files, dust kept on piling on this one too for years. During the 11th five year plan (2007-12) Indian Army was supposed to receive 1,86,168 jackets but nothing much happened. Eventually, it was in 2016 that permission for a one-time ‘interim emergency acquisition’ by taking the ‘revenue route’ was granted by the Modi-led Government to the Indian Army for procuring 50,000 bulleproof vests for Rs 140 crore from Tata Advanced Materials. Modernising air defence: On the air defence front, in April 2017, India signed a two billion dollar deal with Israel Aerospace Industry and another Israeli company, Rafael, for supplying Medium Range Surface to Air Missiles (MR-SAM) to the Indian Army. Additionally, a $630 million contract in 2017 and a $777 million contract in 2018 were signed with Israel Aerospace Industries for Barak-8 Long Range Surface to Air Missile (LR-SAM) to arm India’s frontline warships. This was followed by the mammoth $5.43 billion deal with Russia in 2018 for S-400 Triumf air defence systems, capable of shooting down almost all kinds of incoming missiles, fighters and drones. The deal for 6,000 missiles and associated equipments, including jam resistant phased array radars, was inked in spite of threats of sanctions by US. This was followed in quick succession with a $950 million deal with Russia for two frigates of Project 11,356 class for Indian Navy. In between, exclusive deals worth almost Rs 20,000 crore were also signed by the IAF and the Indian Army for ammunitions, spares and engines to have enough reserve for 10 days of intense fighting in case of any eventuality. Many additional deals are in pipeline including 200 Ka-226 and 48 Mi-17V5 helicopters, acquisition of 464 T-90 tanks and local production of AK series rifles. Some are expected to be signed soon. Further, Prime Minister Narendra Modi’s diplomatic efforts resulting in India being inducted into the exclusive Missile Technology Control Regime (MTCR) club and being granted Strategic Trade Authorisation (STA-1) status by the US also helps the country to enhance the range and quantum of warheads in imported missiles and get access to critical and cutting-edge defence technologies hitherto restricted for India.